So wrote in 1876 my Great, Great Grandfather John Inglis, known to all as ‘the Governor’, in one of his many sailing accounts of cruising by yacht in Scotland in the latter part of the 19th Century. 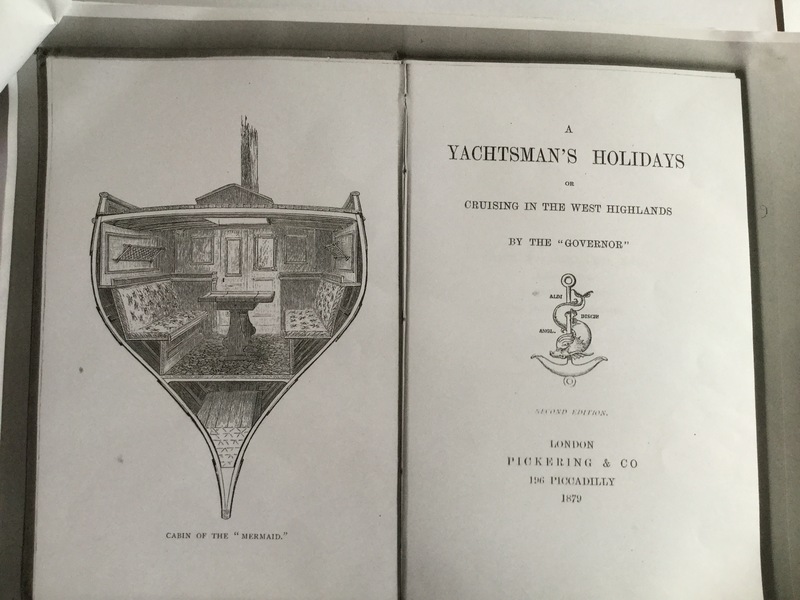 Four of these accounts were published in 1879 under the title ‘A Yachtsman’s Holidays, or Cruising in the West Highlands’ with the author’s nom de plume as above. I thought it would be fun to re-read these, and compare how his cruises were to the one my husband and I have just done in this year, 2017, on board our 38 foot centre-cockpit Rival, Ranger. The last time she was weighed by crane, unladen of fuel, water and wine, she came in at 10 1/2 tons. She is pictured below moored at Loch Aline, one of the Governor’s favourite spots. For any who are interested in reading this book, it is digitised in Google ‘s Archives of noteworthy publications. The four yachts which were written about in the four or so years up to 1876 were all given false names, presumably to save their subsequent owners any embarrassment as each was sold on to make way for its successor. They were all moored at Hunter’s Quay on the South -West side of the Holy Loch near Dunoon, now the ferry terminal for boats to Gourock. In his book he gives amusing accounts of the ”Ilma”, the ”Concordia”, the ”Princess” and the ”Mermaid”. Having been minded to escape his then, rather small, house and ever growing family each Summer, his annual sailing holiday was of the utmost importance. Only after the rheumatism finally got the better of him and prevented him from being a more active sailor, did he have to upsize big-time to ”Cressida”, a steam yacht of 192 tons and 160 HP which was launched in 1884, built by and for himself, and which had the added benefit of allowing his family to accompany him on various nautical adventures. It had on board two pianos in the saloon so that Mother and one of the sons could play duets. The Governor was then 42 years old. Next came the ”Concordia”. Again designed and built by the Governor, and raced by him too, she was an 8 ton Schooner with 2/12 tons of lead in her keel. 34 ft long with a beam of 7’6” and 4’9” headroom–an opening skylight gave a little extra height for one man for dressing or shaving- she had a main mast of 24ft, and a foremast of 22ft. The slightly larger size of the new yacht allowed an extra hand on board, in addition to the four friends. Thus Lachlan made his first appearance, assisted by Duncan, now promoted to cook. Also carried on board that year was a breech-loading rifle, although used most gainfully for target practice on the endless supply of empty bottles which were towed astern. The ”Princess” came next, a Schooner of 16 tons with Lachlan still as Skipper, and Duncan being replaced by Archie. 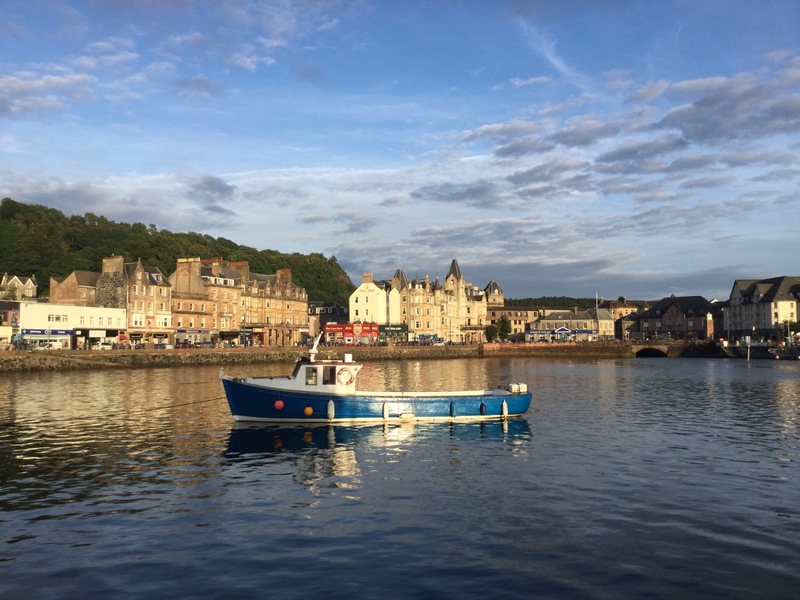 In those days before Engines on yachts, Sat-Nav, Echo-Sounders, Navtex or Radio, you really did need someone on board with local knowledge, and it was commonplace to employ a fisherman such as Lachlan whose family had fished from Skye for generations and knew the weather, tides and currents like no one else. The Governor and his friends allowed the skipper to make all judgement calls on the course steered, sail-trimming and pilotage although they were all very knowledgeable themselves. Back then, if there was no wind, then you got in the yacht’s tender and jolly well rowed, no matter who you were. Anchor watch was usually left to the paid hands however. The ”Princess went to Loch Scavaig, one of the Governors favourite haunts Even he was complaining about the tourists spoiling the peace back then! The photos above show Ranger in Loch Scavaig with the middle yacht, a latecomer, anchored ridiculously close. They got a huge fright when the wind started to howl at 5 in the morning and they had to make a speedy exit as the yachts whirled madly around in circles. It has been reported that as many as 12 yachts have tried to squeeze in this tourist hotspot. Not advisable in this most inhospitable of anchorages! Like us, the Governor and his friends were very fond of walking around Loch Coruisk, and they loved to fish just as we do. The ”Mermaid” went to Loch Scavaig too. By that time, my somewhat overweight and rheumaticky Great, Great Grandfather had built himself a super Cutter of 20 tons. She too was raced. The summer of 1876 they took on board a total of four crew, namely a Steward proficient in the arts of the Galley , who self-styled himself as ”Hofmeester”, being a Dutchman named Van Touwslager, Lachlan the Skipper, Archy and a young general utility hand called Jack. And so to our cruise. Well , certainly , Langoustines became a firm favourite, the ones being purchased fresh in Stornoway ,and cooked on board, being a highlight. Likewise the kippers eaten for breakfast in Loch Claidh. The best Restaurant we ate in was the Pierhouse, Appin. H Here are some of the lovely places we managed to visit. and through the Caledonian Canal twice!